While the art works of Th. Kittelsen for a Norwegian audience often can be related to the fairytale about the small boy gazing the imaginary castle of gold in the horizon, can Kittelsen be understood completely different by an international audience. Blaafarveværket has since the 1980’s collected the original artworks of Th. Kittelsen, and several international exhibitions have been granted loans from the collection. The combination of Black metal and the Golden Age of painting are seldom mentioned. Kittelsen’s art do somehow fit both categories. The Norwegian black metal pioneers in Burzum used his motives for two of their albums: “Hvis lyset tar oss” (1994) and “Filosofem” (1996). This seems maybe an odd choice for most Norwegian eyes. But for an international audience, this makes sense. What is the main idea behind the exhibition Altars of Madness? The main idea was to show a generation of artists who had been deeply influenced by a musical culture named « extreme metal ». I’ve been actively involved in this culture myself so i have been intrigued to find the typical elements and obvious references in the work of Matthew Barney, Torbjorn Rodland, Harmony Korine, Banks Violette or Mark Titchner. I started to get in contact with each of them and discuss about our common interests. The encounter of artist Damien Deroubaix had been determinant because we decided to do a publication dedicated to this generation of artists which is the origin of Altars of Madness. But the underlying idea behind the exhibition is to reveal what are the thoughts inherent in this culture. My main interest in this culture is the meaning of the extreme itself throught the aspects of death, of politics and subversion. Several artists of the exhibition question the extreme the way Georges Bataille would do. Death for example is an extreme point as we ignore what stands behind the precise point we never came back. Vladimir Jankélévitch explained this perfecty in his essay La Mort. The question of the extreme is very linked to Modernity. Philosophers such as Alain Badiou or Mehdi Belhaj-Kacem are pointing the « inaesthetic » as the core of Modernity, in a way this is really what does extreme metal. When making the selections while preparing the exhibition, what were your guiding principles when including and excluding artists and works of art? Altars of Madness refers to a very singular culture, and the idea is to reveal the thoughts and the aesthetic this one could generate from the inside. For this reason it seemed important to include artists who have been invloved in it. This was also necessary as referring to extreme metal became a kind of « trend » for many artists today. In the exhibition Gee Vaucher, Larry Carroll and Theodor Kittelen have a specific place, they can be considered as inspirators and sources. Our attention towards this exhibition was definitively challenged, because your selections of highly contemporary artists, where most of them have a rather significant artistically developed language, were to be put together with Th. Kittelsen, who for the last 99 years have been unproductive. How come you would include his works in your presentation? It wanted to give to Theodor Kittelsen a place of choice in the exhibition. When Altars of Madness refers to black metal, it refers to a subculture that emerged in the mid eighties but Theodor Kittelsen established a century earlier an easthetic that i consider as the most interesting aspect of the back metal iconography today. His influence on black metal – through the Norwegian landscape and northern pagan mythology – is something we still feel in the work of contemporary artists such as Torbjorn Rodland, Élodie Lesourd or Seldon Hunt among many others. It was important to me to show his work in confrontation with these artists, as well as Harmony Korine and Steven Shearer. There will be three works on display, that usually are exhibited at the Th. 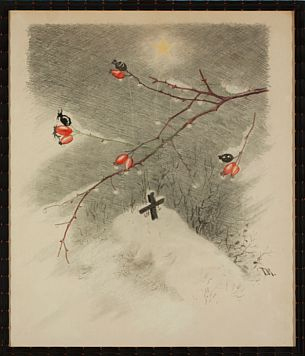 Kittelsen Museum, namely “New Year’s New Moon”, “Dance Macabre” and “Graveyard in a starry night”. Do these works in your opinion reflect the basic ideas and cultural foundation as a heritage for what later in the 20th century found its expression in the black metal culture? Definitely yes. To my mind the work of Theodor Kittelsen concentrate the main interests of black metal and could give a different interpretation on this culture. Actually a certain Norwegian landscape seems to be the central subject of black metal. Many lyrics and record covers are referring to the landscape. This, as well as the northern pagan myths, is the central element of this culture, that is what reveals Altars of Madness. Only a few musicians declared to be satanists in the early years. Today, we used to say « true Norwegian black metal » and not « true satanist black metal ». It would need to focus on this aspect with a larger choice of works by Theodor Kittelsen and the collaboration of the musicians themselves to reveal how relevent and obvious it is. The last time Th. Kittelsen were exhibited abroad, was in connection with the European sources that were inspiration for Walt Disney. How should we consider the fact that two rather different expressions of popular culture, both can be drawn from the same cultural historical environment? I guess Walt Disney company had to explore not only the litterature tradition of fables and fairy tales but also its imagery tradition. Naturally Theodor Kittelsen becomes a reference as well as illustrators such as John Bauer. Norwegian black metal appeared in a period when grindcore and death metal were already defining extreme metal as we know. The first bands such as Mayhem had to find their own identity and they found it in their major difference with the other scenes, their cultural roots. Theodor Kittelsen is very well known in Norway and i’m not suprised a musician such as Varg Vikernes saw here exactly what he wanted to express, more than in Böcklin or in the painters of the macabre. What is also interesting is the fact several contemporary artists referring to black metal also show the landscape the way Theodor Kittelsen did a century earlier. Kittelsen’s work is timeless. I’m always surprised only a few people in France know his work, for this i’m glad Altars of Madness comes in France after Luxembourg. (Exhibition has ended. A two-volume Cataloge, including images from the exhibtion, has been published).